Selected in the third round (25th overall) of the 2018 CFL draft and signed on May 14, 2018. 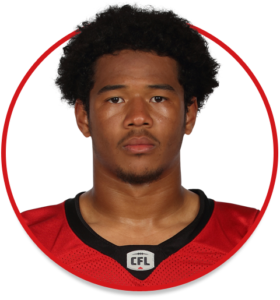 (Calgary) Metchie appeared in seven games during his rookie season and recorded five special-teams tackles. He made his CFL debut in a Week 3 home game against Ottawa and his first two career special-teams tackles came in a Week 10 contest at Saskatchewan. Metchie had three special-teams tackles in Week 13 at Edmonton. Metchie played 28 games over four seasons (2014-17) at Guelph and recorded 108 tackles including six tackles for loss, one sack, two interceptions, one fumble recovery, one forced fumble and nine pass breakups. In 2017, he was second on the Gryphons with 50 tackles. Metchie was born in Nigeria and grew up in Brampton, Ont., and is a graduate of Brampton’s St. Edmund Campion Secondary School. He also played for the Ontario Varsity Football League’s Brampton Bulldogs.